It’s official: retro furniture is seeing a comeback onto the trendy furniture scene, and it’s coming back better than ever. After the revival of 70s/80s chic fashion and the resurgence of vinyl, it was only inevitable that the furniture that defined the homes of the past would be the inspiration for the retro resurgence of our current time. From humble beginnings, first appearing as a word in the classical language of Latins’ vocabulary as “prefix retro”, meaning backwards or in past times, retro is a term that encapsulates the style of yesteryear, rather than a certain period of the past. Having been a term to cover everything from fashion to furniture, style, persona and art, retro is distinct in the way that it is able to encompass so much, allowing it to imitate the best whilst leaving behind the worst. Retro furniture has over the years formed to consolidate its own distinct style involving wooden materials, bright off-tone colours and furniture shapes that aren’t as rigid in style as their regular furniture counterparts. Retro furniture is the type of furniture that can be easily dismissed as a disaster, but its individuality and uniqueness work to ensure its place for it in a modern world. There are many reasons as to why retro furniture is coming back and why many would decide to decorate their house with such a classic design. One of these reasons is that it allows you to stand out from the crowd, ensuring your home is unlike none other in the modern day world. A retro theme to your household provides a homeowner with something that they can show off to any guests that they decide to bring round – and it looks exceptionally good as a backdrop to photos! This may not seem like a major factor, but the “Instagrammable” factor has always been the most important factor to millennials in relation to making a decision: whether that’ll be the destination of a holiday they want to book, the choice of venue that they want to visit or the buying habits of millennials, so the same can easily be correlated to the furniture used when decorating their home. Another reason why the return of retro is imminent is that it brings out the best. As retro furniture is seen as a pick and mix of the best fashion and furniture, style, persona and art from the past, this otherwise stylish retro look allows it to appeal to the mainstream masses, of whom enjoy adding a bit of style to their homes. Utilising some of the best patterns, colour schemes and materials, retro furniture is seen as significantly high standard and an aesthetically pleasing design to be around. Cheapness also comes into play in growing the number of property owners taking on a retro feel to their home. As retro furniture isn’t always bought brand new, but sometimes as second-hand or charity shop purchased, whilst too utilising a theme that isn’t as popular and ‘modern’, the price of such furniture is dramatically cheaper than its more modern counterparts. This makes retro furniture affordable to the general consumer, whilst still providing quality furniture that’ll complete a home. Retro furniture is set to continue to increase in popularity over the upcoming years, too, as items from today’s present soon become items from the past. The throwback to the past also brings with it a major factor of retros impending revival. Classical aesthetic has been quite the prevailing force in present times, with the resurgence in vinyl being one of these examples where ‘old meets new’, the revival of retro is just another one of those great forces from the past chirping its head in the present. When exploring for outlets that sell retro furniture, it’s likely you’ll be about to grab a purchase from more familiar places than you’d otherwise expect, removing the necessity to go to extreme lengths to pick up retro furniture for your home. 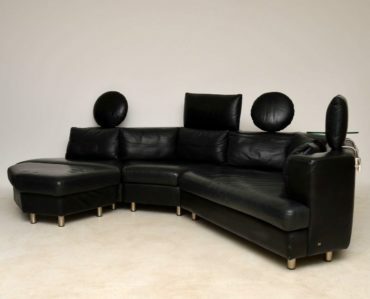 It’s important that when looking for retro furniture, you don’t limit yourself to self-titled “Retro” furniture product names as such is more of a lure, but rather to fully experience the ‘retro’ style that products may display upon looking to make a purchase. At Retrospective Interiors, we offer numerous retro-like products that’ll look perfect in any home. We like to define ourselves by offering some of the finest furniture lines, featuring the best shapes and crafted with the ultimate first-rate materials. If you’d like to view our full range of ‘retro’ inspired furniture that we offer, be sure to explore our latest products. Kensington Church Street dealer Rolleston recently sold a William and Mary cabinet to an international museum for a mid-six-figure sum. 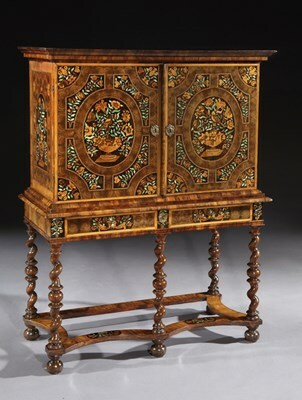 The c. 1690 oyster veneered olive wood cabinet features fine walnut marquetry and the gallery’s Camilla Rolleston Pinsent said of the piece: “It is important because of the exceptional craftsmanship of the marquetry, the vibrancy of the colours and the wonderful condition of the piece which retains its original stand. The sale coincided with BADA 2017, where Rolleston took a stand, though the sale was not connected with the fair. However, another cabinet that was sold at the fair was a George I japanned bureau cabinet, which also went for a six-figure sum, at the stand of Godson & Coles. The George I period double domed cabinet is dated to c. 1720 and is attributed to John Belchier. It is lavishly decorated in scarlet and gilt with scenes of figures, foliage and birds and a similar example can be seen at Erddig, now owned by the National Trust. 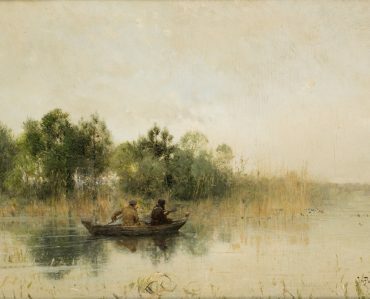 This 1885 Ivan Pokhitonov, 6 x 10in (15 x 25cm), called ‘Duck Hunters on a Lake’ will be offered by Harry Moore-Gwyn at 25 Blythe Road’s British and Continental Pictures auction on April 5. It carries an estimate of £60,000-£80,000. The 140 pictures will be offered for sale by Harry Moore-Gwyn at 25 Blythe Road’s British and Continental Pictures auction on April 5. The collection comprises a range of Victorian pictures by artists including Charles Napier Hemy and Sir Joseph Noel Paton. However the highlight of the sale is a work by Russian artist Ivan Pavlovich Pokhitonov (1851-1924), carrying an estimate of £60,000-£80,000. Pokhitonov’s Duck Hunters on a Lake (1885) is typical of the hunting and shooting scenes that the artist is known for. Pokhitonov expert Olivier Bertrand has confirmed the authenticity of this work and its inclusion in his catalogue raisonné. A significant number of the paintings from the club feature animals, in keeping with the traditional pursuits of the gentleman’s club members of hunting and shooting. The sale includes around 25 pictures of dogs, more than 10 equestrian pictures and a number of 19th century oil paintings of rabbits, foxes and stags.